If you haven’t been following the TAGS story this is my long-standing project to make it easier for people to archive Twitter results to a Google Sheet. The brief history lesson is this project started in 2010 when you didn’t need any authentication, you could copy the template enter your search term and start collecting tweets. In 2012 Twitter announced changes to the way you could get access to the data requiring user authentication and so in 2013 TAGS v5.0 was born. 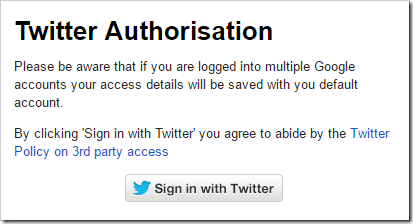 The way TAGS v5.0 implemented authentication was to get the user to register for a Twitter Developer account. There is no cost to doing this and to this day you can still sign up as a developer with Twitter. Setting up a developer account requires some form filling which is prone to users copy/pasting the wrong thing. Perhaps a bigger deal breaker for some is Twitter Developer accounts needs a validated mobile phone number. When I was developing TAGS v5.0 there was an opportunity to use a single developer account which would then only require the user to sign in with their Twitter account. At the time I chose not to go down that route as part of the philosophy behind the project was a guerrilla approach, you archive your own tweets with your access details if Twitter shut me down. Three years on from TAGS v5.0 I’m still here. Having also recently given a workshop at University of Edinburgh’s Digital Day of Ideas I was reminded of the pain of setting up TAGS for the first time. With that in mind I’m beta testing TAGS v6.1. This removes the need to set up and Twitter Developer account, hopefully bring more people to the Twitter archiving party. There’s still an option to use your own Twitter Developer account. So now all you need to do is copy the template and sign in using a regular Twitter account. Note: TAGS 6.1 runs separately from earlier versions of TAGS so your existing archives will keep collecting tweets using your existing authentication. At a couple of confs early next month so happy to beta test! An amazing piece of tech gets that more amazing. I just set up a new one for second cycle of #UDGAgora, but I can redo with the new one to test it. So you are using a single set of twitter dev keys?? Or some other dark magic? Think big, Hawksey, think big. I just ran it, everything did work well, it’s a lot of pop ups and clicks, but definitely easier for people new to not have to set up twitter keys. I triggered it by doing “Run Now” but after all the authentication, I had to do that once more to trigger the first fetch. I set up a new tags search, without any bother. I first didn’t run TAGS > Setup Twitter Access as I already had some tags sheets ticking away. When I hit ‘Run Now!’ I was asked to authenticate, I did so with the simpler method without any problem and the search works. Oh, I should say that doing a second sheet after jumping through the hoops is a breeze! It just worked, one authentication click, and it is running. Thanks. I have been running 6.0 for a few conference, including the currently live #ssp2016 – is 6.1 different? Many thanks for making this tool available. Got the “easy access” up and running in Chrome very easily. For whatever reason, it didn’t work in Firefox, though. 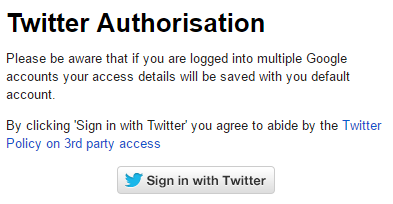 The new window to authorize TAGS to use Twitter just never opened. Could be a problem with my pop-up blocker or a broader Firefox problem, dunno. But anyway, thanks again for such a cool (and long-lasting) project! Thanks for giving it a try and letting me know. Is it a built in ad blocker in Firefox or a particular add-in you use? Is there a possibility to get more user information? Or is there a way to add this my self? I have accessed twitter data using TAGS and I also have NodeXL Pro installed. TAGS can access more twitter data than NodeXL, but NodeXL is capable in analysis. Could you please advise how to export TAGS data into NodeXL? Another thing, is there any software that I can use to analyse TAGS data like NodeXL can do? Thanks Martin. I used TAGS6.1. A and B columns work fine, but C did not. Is it because TAGS6.1 different from TAGS6.0? suddenly column C appeared (!) after I re-opened the TAGS file. I then downloaded the file into xlsx file. But I couldn’t find how NodeXL can import the xlsx file. Do I have to copy each column? Can you help? Just created a bot to tweet based off of my main twitter account. I copy and pasted my Twitter archive into the TAGS archive from Excel since I can’t read tweets passed a week ago but now I get 1-5 word tweets only. Is there an easier and more effective way to use my whole archive? Thanks Martin. I can now import TAGS data into NodeXL. However, several analyses are missing. Is the columns’ title has to be identical and follow the order with those using NodeXL’s own generated data set?